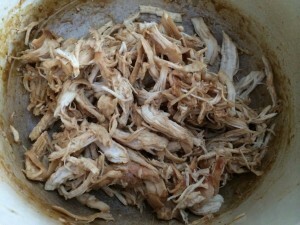 This easy shredded chicken recipe is such low-effort cooking that I should do it more often. On busy days you can just throw the ingredients in a stock pot and let it get to work. A few minutes before serving you put a little bit of effort into it and you are done! It’s a great way to serve a meal full of meat, vegetables and flavour. High protein, low fat, low carb. A dieters dream! Chicken stock (for this I recommend Oxo – it crumbles better). 1 per chicken breast and 1 for the pot. Water (1/2 cup per chicken breast). Crumble the chicken oxo cubes and sprinkle over both sides of the raw chicken. 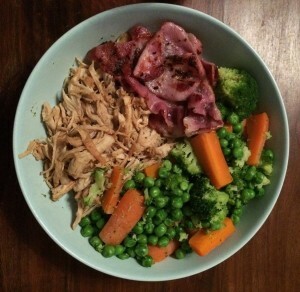 Be liberal – use a whole stock cube per breast. Once they are covered, fry the chicken breast on both sides to seal. Once the chicken is sealed (not cooked through), add a 1/2 cup of boiling water per chicken breast and crumble in a final stock cube. Place the lid on the stock pot and reduce the heat to a low simmer. Every 30 mins or so, flip the chicken breasts over and if needed, add a little more water. When it comes to serving, this dish is ready-made for vegetables. I paired it with carrots, peas and broccoli and added to the protein content with a couple of slices of fried bacon! Shredded chicken is a simple way to prepare and add a lot of flavour to a meat that is often criticised for being bland and boring. It’s low-effort cooking and so versatile – you can add shredded chicken to soup, curries, tacos etc! With shredded chicken in your cooking play-book you won’t eat boring chicken again! Previous Previous post: Are Personal Trainers Putting People OFF Fitness?